It started out as a bit of fun to create festive cheer, but little did staff at Hull University Teaching Hospitals NHS Trust know they were about to get a history lesson. The Dr Hermon Cup was originally awarded back in 1938 to the ‘Best Decorated Ward’ at the old Anlaby Road Hospital. 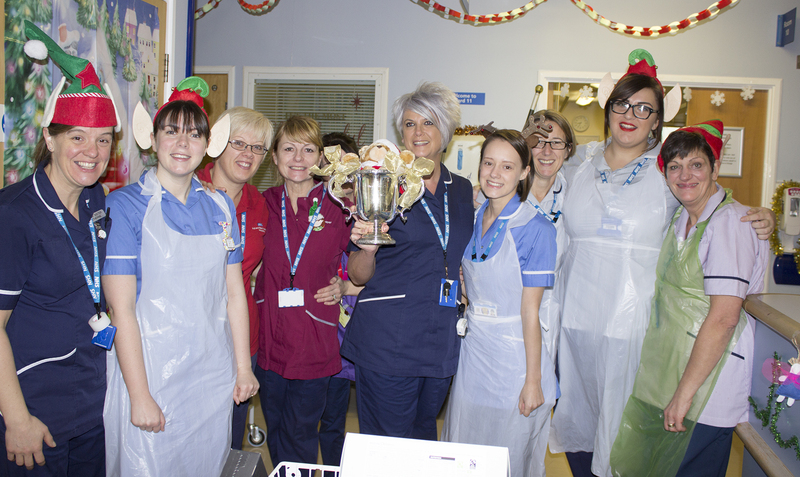 After the 78-year-old silver trophy was recently uncovered in the Trust Archive, a small team of staff decided to stage a new competition to crown the hospitals’ most festive ward or patient-facing department of 2016. But the identity of Dr Hermon was still unknown. Step forward Angela Chapman, a Personal Assistant working in the Estates, Facilities and Development Team. As the competition was being promoted to staff across Castle Hill Hospital and Hull Royal Infirmary, Angela’s interest was piqued by the spelling of the doctor’s surname. After consulting her mum, whose maiden name was Hermon, the origins of the cup could be traced to Dr Richard Hermon, an Honorary Radiologist working in the city in the 20s, 30s and 40s, and the cousin of Angela’s maternal grandfather. “I knew as soon as I saw the name that there must be some connection, as Hermon is quite an unusual name, and particularly that way of spelling it. I thought it just had to be a relative, and when I checked with mum, who’s in her 80s, it turns out that Richard Hermon was indeed my grandfather’s cousin on my mum’s side. And whilst there were many worthy entries into the competition this year, there could only be one winner. After considering entrants’ decorations, events and activities for patients and staff, and how teams have been working to spread Christmas cheer, a judging panel of five chose Ward 11 at Castle Hill Hospital, which provides colorectal care, as their overall winner. “The Dr Hermon Cup is an important part of our hospitals’ history and it’s great to be able to re-award it again in 2016, almost 80 years after it was first presented. “Our hospitals can get very busy in winter and staff can find themselves under a lot of pressure, which is why something as simple as this competition is so important, not only as a bit of light relief for staff, but it also helps to get people talking and bring people together. “Hospital workers in many, many departments have clearly pulled out all the stops to create a festive atmosphere for patients, visitors and colleagues, and to make time in hospital that bit brighter for our patients. From carol singing and gifts to take away, to a giant advent calendar and even a reindeer with his own ID badge, we’ve been so impressed with just how imaginative people have been. Construction of a ‘Selfie Elf’ for patients, visitors and staff to have their picture taken with. Arranging choral performances from a local primary school, church, and the HEY! Let’s Sing staff choir.